Daily scheduled flights to Seattle: Seaplanes from Friday Harbor & Roche Harbor marinas, land planes from Friday Harbor Airport. 45 min to Seattle. 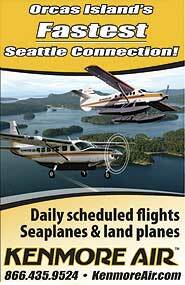 Daily scheduled flights to Seattle: seaplanes from Deer Harbor. Rosario & West Sound, land planes from Eastsound. 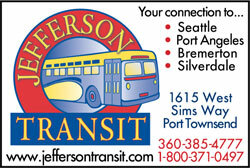 Free Sea-Tac shuttle. 4 hour, Daily, weekly or monthly rates. 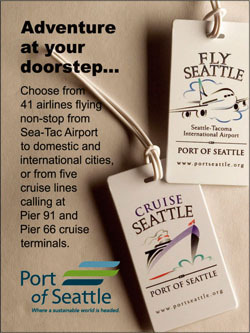 Walking distance from ferry or free pick-up. Family owned and operated. Driving for You! Water Taxi service to all islands & the mainland. Daily service to Sucia Island. Year round full service “Clean Marina” Permanent & guest moorage. U.S. Custom. Seaplane base, pump-outs. 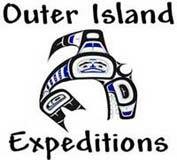 Reliable service, and tours to fit your itinerary. 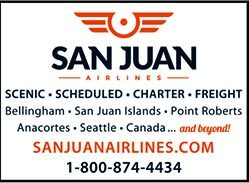 Daily Schedule flights: Anacortes, Bellingham, San Juan Islands & British Columbia • Freight • Rental Cars • Scenic Flights.